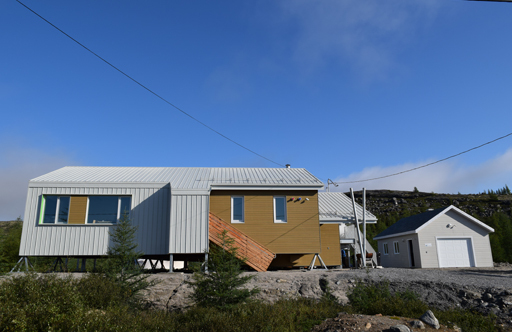 CEN Kangiqsualujjuaq SUKUIJARVIK Research Station is owned and run by the Centre d’études nordiques (CEN: Centre for northern studies) at Université Laval. The station is part of the CEN Network of research stations. The station is run in close collaboration with the community of Kangiqsualujjuaq and the Qiniqtiq LandHolding Corporation. 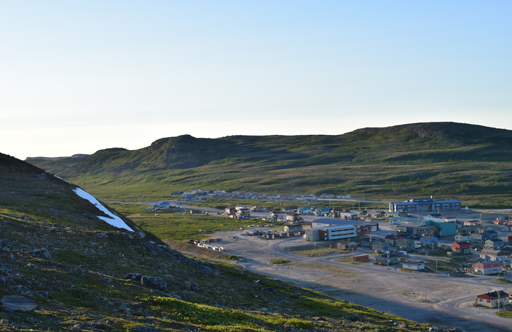 Location: The station is situated in the community of Kangiqsualujjuaq (population of 942 in 2016), on the shores of George River which flows into Ungava Bay, Nunavik, Quebec, Canada. Opening year: The station opened in 2018. Precipitations: Rain and snow; total ave. annual precipitation 500-600 mm water, half of which was in the form of snow. Altitude: 28 m at station ; 0 m to 1646 m in area (including Torngat Mountains, Mount Iberville). This region is characterized by deep valleys shaped by glacier retreat and steep cliffs. Several remains from the last glaciation can be found here: trough valleys, cirques, morainic ridges, suspended valleys, etc. The cold climate and topographic heterogeneity create a diverse landscape with tundra, forest tundra and boreal forest vegetation. The valley bottoms are ecologically rich, characterized by a rise of the boreal forest (with the presence of spruce, larch, birch, etc.) that contrasts with the bare areas of the region's slopes and peaks. In terms of wildlife, the distribution of species is closely linked to vegetation, relief and climate. A special feature of this area is the presence of the George River caribou herd and further from the village, the Torngat Mountains herd. Wolf, black bear, snowy owl and willow ptarmigan also inhabit this area. Atlantic salmon and Arctic char are numerous in the region's rivers. As for Ungava Bay and the rivers that flow into it, it represents an estuary rich in salmon, Arctic char, brook trout, beluga whales, and several seal species. 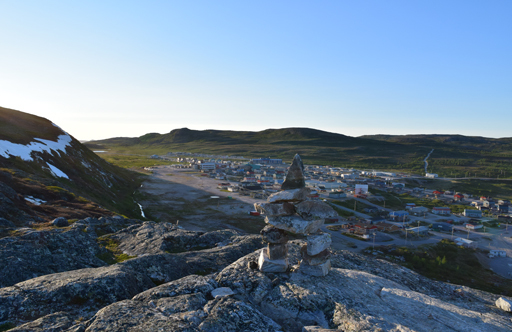 Archaeological sites associated with Thule, Dorset and pre-Dorset populations have been identified in the Kangiqsualujjuaq area. The first traces of occupation are dated around 2350 BP. In 1838, the first trading post was established at the present site of the village by the Hudson's Bay Company. In 1959, the first Inuit co-op, the Fédération des coopératives du Nouveau-Québec (FCNQ) was founded in Kangiqsualujjuaq. Until 1980, the village was known as George River or Port Nouveau-Québec. Kangiqsualujjuaq has a population of 942. Inuktitut, English and some French are spoken. 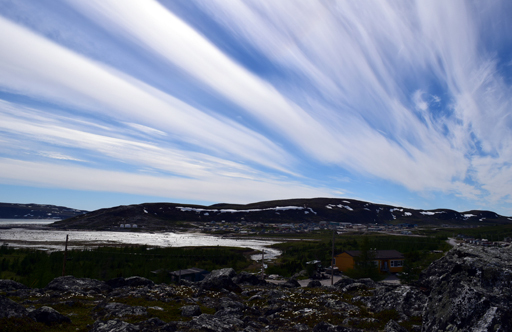 Today, the village is the gateway to Kuururjuaq National Park and the Torngat Mountains (Nunavik Parks). 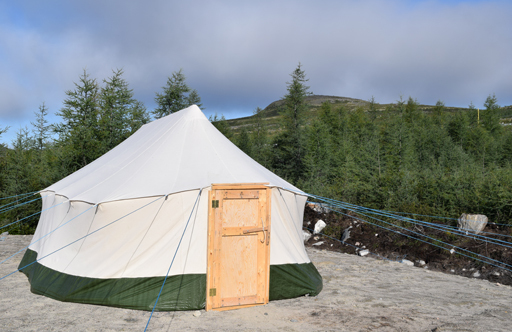 Ulittaniujalik Park, a second provincial park operated by Nunavik Parks, is currently being created. There is Mount Caubvick (D'Iberville), the highest peak in the province of Quebec culminating at 1646m. 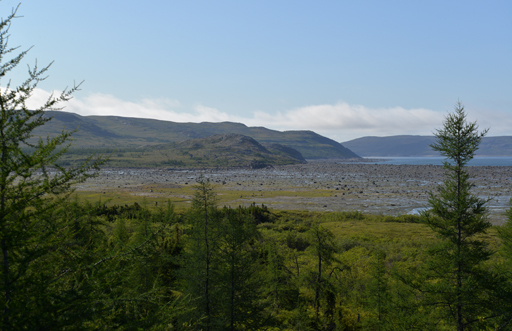 Past and current research focuses on permafrost, coastal geology and geomorphological characterization of the region. Other research areas cover caribou population dynamics, impacts of permafrost thawing in the context of climate warming; slope dynamics; wetland paleoecology; snow and ice dynamics; water quality and contamination; and plant community dynamics and northern plant response to climate change. 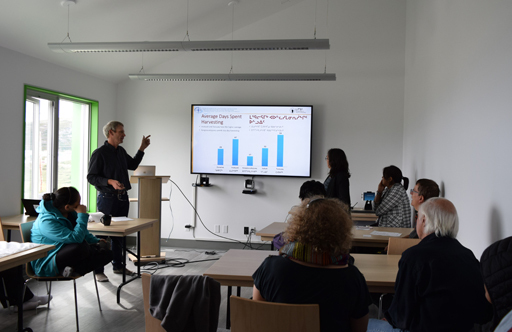 Archaeological studies and community follow-up activities also take place such as the Avativut project "Science in Nunavik, high school students learning in relation to their territory". No official research permit is required but local authorities must accept all research activities before they take place. You must prepare a letter and supporting documents (in plain language) and send them to the station manager, the Qiniqtiq Landholding Corporation and the Northern Village of Kangiqsualujjuaq. CEN's Nordicana D journal publishes data reports, facilitating the management of data sets generated by CEN. The following Nordicana D issue is available from Kangiqsualujjuaq: Sarrazin, D., Allard, M. 2018. 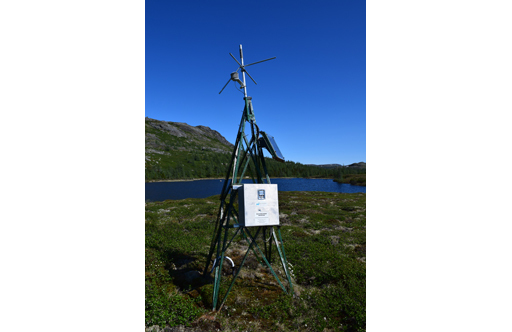 Data from climate stations in the Kangiqsualujjuaq region of Nunavik, Quebec, Canada, v. 1.3 (1988-2017). Nordicana D14, doi: 10.5885/45264SL-AF7FDA53F9E44927. Visit the Nordicanca D site for a complete list of data series. Total area: The area under the roof for the main building for sample manipulation is 26 m2 and 25 m2 for the garage. Number of rooms (beds): The station has 2 rooms, one with 1 bunk bed (2 beds) and one with two bunk beds (4 beds). The station also has one meeting room, a kitchen, a sample manipulation room and 2 bathrooms (one with shower and washer/dryer for residents). Capacity: 6 beds; 25 people seated in meeting room (training, presentations). Power source is electrical, solar panels will be installed shortly. There is running water that is drinkable. Heating is with an oil furnace. Garbage is collected on a weekly basis, there are bins outside of the stations for this purpose. There is no recycling facility in the village. A telephone is available in the station for local calls only. The phone number at the station is: 819-337-5488. A calling card must be used for all long distance calls. Satellite phones and VHF are available for rent for members from the CEN. There is a router at the station with intermediate-level internet access. Printer, scanner and fax services are available in the village. Chemical storage is not authorized. There is no fumehood, hence only mild chemicals can be used. All chemicals brought in must be brought out immediately. For sample preparation, there is an oven, a freezer (-80°C), refrigerator, scales, some basic glassware, and centrifuge. One ATV (1 passenger) and one side-by-side (6 passengers) can be rented. Snowmobiles, trucks, and other ATV’scan be rented in the village. Local guides and translators available for hire. Daily access by commercial airline (Air Inuit) from Kuujjuaq. Kuujjuaq is accessible by commercial airline (Air Inuit, First Air) through Montreal, Ottawa and Quebec. Every summer, two cargo ships allow shipping of heavy equipment and materials (May-June to August-September), though this requires advance planning. Nunavik Rotors, Héli-Inter and Canadian Helicopters offer helicopter services. Air Inuit and Air Creebec offer air charters. Gravel airstrip of 1073 × 30 m (length x width). The airport is 2.5km from the station. Lake landing and heliport are available. Ship docking facilities (landing wharf and pier) are found. Ship docking facilities (landing wharf and pier) are also found. Safety equipment recommended for work outside the village: pepper spray, scaring pistol, communication device, first aid kit, weapon. Hire of a local guide. It is the responsibility of the user of the station to ensure that he or she has the necessary insurance to complete his or her research. The CNESST provides insurance coverage to employees or student employees only for accidents at work. In all other cases, personal insurance must cover victims for accidents and evacuation. It is therefore essential to have adequate coverage in terms of activity and destination. Quebec Health Insurance is valid in the area. Well-equipped medical facilities (standard) and staff with basic medical training (2 employees) are found at the CLSC (community hospital). Nearest hospital is in Kuujjuaq (45 min). The station is not equipped with compulsory safety equipment (defibrillator). Air medic offers individual, family, and temporary protection plan to obtain emergency medical or airborne services on 100% of the Quebec territory. The station and related services are available to all researchers (university, college, governmental and private) working in the area. The station can also accommodate small groups of students.